Back in the early days of several franchises, the second game in a series tended to be radically different from the first, because developers had not quite pinned down what they wanted the series to become - take a look at Castlevania II or the western Super Mario Bros. 2 for example. Zelda II is another big name usually cited in lists like these, and probably the most radically different when compared to its predecessor. 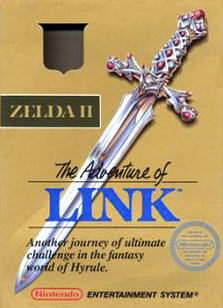 The original Zelda was viewed entirely from a top-down perspective and featured a large overworld with a multitude of dungeons, in which Link could walk in four directions and (eventually) had several weapons at his disposal. For Zelda II, Nintendo threw all of this out of the window and started completely fresh. 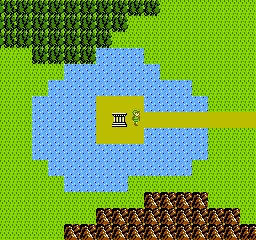 The overworld is still viewed from above, but it's more like a Dragon Quest game - You can only move onto set squares and there's various towns, caves and dungeons to enter. Wander around too long and (visible) enemies will pop up - collide with one of them and you'll be taken to a battle scene with the enemies in it as well as the location depending on the type of square you were on. All these non-overworld scenes are where Zelda II really gets different - as soon as you enter one of them, the game becomes a 2D scroller in which you can only move left and right, as well as being able to jump at will, a rarity in Zelda games nowadays. Fighting enemies gives you experience points, and when you reach a certain amount, you'll level up and get to increase your strength, which increases your attack power, life (which is basically defence) or magic, which lowers the cost of spells. Surprisingly, despite there being experience points, you won't have to grind for hours on end, as clearing a dungeon will instantly get you to the next level no matter how much XP away it is. You'll also find experience bags in secret areas or as rare drops from enemies, which give you a big boost, meaning it never takes that long to get a level up. These spells are also new to Zelda II and are learned in the game's various towns. They play quite a big role, as several of them are needed to advance - utility spells like a high jump and a "fairy" spell that lets you fly are a necessity to get past a few of the dungeons, while others, like the fireball spell, allow you to defeat otherwise invincible enemies. There's also a heal spell which you'll probably find yourself using the most. All spells cost magic power. Your stock is displayed in a bar next to your health, which, just like the health bar, can be extended by locating special items - in this case, potions, rather than heart containers. Noticably, in return for getting magic, every single other form of attack Link enjoyed previously is gone: no bow, no bombs, no boomerang, no nothing! Zelda II's a bit more straighforward than the first game, with a relatively simple overworld and several towns with people that provide clues - which mercifully aren't as vague as those in Castlevania II. That said, there's still a bit of trial and error involved when it comes to getting all the available health and magic extensions - some of them are hidden in completely non-descript squares of the overworld that look absolutely no different from others. And believe us when we say you will want to get all of them - the original Zelda was quite difficult, but Zelda II is no slouch either, with massive dungeons filled to the brim with tough enemies and several tough bosses. There's also a bit of a platforming aspect to the game, and you'll find several dungeons with water and lava pits that will instantly kill you if you fall into them - and as you get knocked back a bit when hit by enemies, you'll want to be as careful around these as possible. In terms of graphics and music Zelda II is about on the same level with its predecessor. There are lots of different locations due to overworld battle locations being based on what kind of square you were on, and the soundtrack has lots of catchy tunes. You might recognize the main dungeon theme as the "Temple" music from Super Smash Bros. Melee and Brawl. 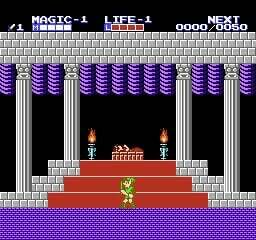 Zelda II always seems to get a lot of hate for being so different from the rest of the series, but if you can see past the things it does differently there's actually a very addictive, engaging little game in there. Combat in sidescrolling form is a lot more entertaining than Link's hard-to-use overhead stabs from the first game, and all the new additions like the experience system and magic work surprisingly well. Back in the day, the game also seemed to be disliked for its difficulty, but hopefully the 3DS Virtual Console's save states will take care of that problem. Great review Marcel, but I don't think I would have given this an 8. Losing experience when you die, having some enemies not give experience, having some enemies remove your experience, having to guess/need a guide for a majority of hidden secrets, most of townpeople saying useless stuff like "I know nothing" and "hello", having to waste time walking back to where you wanted to be when you die. That's quite a lot of bad game design to have to look past! This game was somewhat promising, but it does so much wrong it's not even funny. It's more like Castlevania II than one might think. Zelda II was a great game that is often remembered in a bad light. It can not be, and should not be, compared to other titles in the series. When reviewed as its own entity, it can stand among many side scrolling adventure-rpg games of the era. It was far from perfect, but still holds a solid 7/10 in my book. This game is quite challenging, would not recommend it to someone who gets frustrated easily, haha. The challenge is what makes it really fun still. Why don't all the people who complain about Mario being too easy play this? Perfectly beatable, but quite a fun challenge. Needs more love. I still really enjoy this game. When is this coming to NA? And isn't it like $5??? If so ill pick it up. I love this Zelda NES!!! Crazy hard, even as a die-hard Zelda fan for the past 25 years, Zelda II still gets a thumbs down. I'd wager even with save-state, this game is still merciless. Still better than the first one. Link to the Past is the first Zelda game in the series I actually enjoy playing. This one just keeps finding new ways to screw you over. Once you get used to the tough enemies like Iron Knuckles and Goriyas (as you eventually will), you meet the ones that can sap your experience. Get used to those, and then you find the ones that won't die unless you cast fire. You're barely coping with those, and all of a sudden you're up against invisible enemies! I found myself constantly using restore points on this game to the point where I wish Nintendo would simplify the process of using restore points! At least I've progressed slightly more this time around than just running around the overworld having no clue where to go. 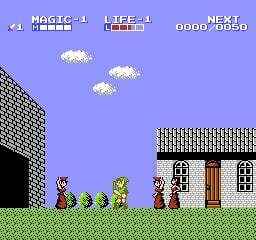 Zelda II is truly one of my favorite NES games ever!!! Well deserved score of 8. There is a special place in my heart for this, Mario 2, and Castlevaina 2. Just because they were different doesn't mean they were bad! Beating this game without restore points was a hefty challenge, but one that I enjoyed a lot. I prefer this over the first game so well deserved 8. I actually like this better than the first game. I really hope they bring back leveling up in a Zelda title. I want Wii U Zelda to be like SKYRIM! @SteveW They do, but only on the 3DS. The Wii doesn't have save states. This is my 3rd favorite Zelda game ever and not due to nostalgia since I never played it until last year. It's hard but incredibly satisfying to beat. Save states? Don't make me laugh! Play this game like a real man. but really, i want it for NA! I really enjoy this game. It's not my favourite in the series, but it's a solid action platformer/RPG hybrid. Just because it's different doesn't mean it's bad. 8 seems a bit excessive for this game IMO. I think 8 is about right. I enjoyed this Zelda game, and I enjoyed it much, much more than A Link to the Past, The Skyward Sword, and Spirit Tracks. Not as good as any other Zelda game, but on par with the first one. 8 is a great score this game was hated by a lot of people and it's finally getting some recognition. Lot's of people are coming out of the woodwork claiming to love this game! @whitetrashguy If you want to play SKYRIM, go play SKYRIM. Let Zelda be Zelda. This is a fun, addiciting game, and deserves the 8 it received, but it is Zelda by name only and not even close to Zelda classics like A Link to the Past, Ocarina of Time, Majora's Mask, Wind Waker, Twilight Princess, and Skyward Sword. Great review, and I have to agree with the score unquestionably. I owned this as a kid and could never get into it (despite years of trying). I played and finished it as an ambassador (pre-restore-points) and fell in love. It's not an easy game by any stretch of the imagination and you definitely have to engage it on its own terms, but it's oh so satisfying to finish. Love this one. Still one of the most baffling moments in gaming ever. "The original Zelda was viewed entirely from a top-down perspective"
not on NA 3DS VC yet? oh, ok then, i'll just stick with the crappy VC nintendo gave me as an ambassador! THANKS FOR THE INABILITY TO MAKE CHECKPOINTS ON THE AMBASSADOR VC NINTENDO, I FEEL LIKE A baddonkey PLAYING THIS GAME. Its not bad because its different, its bad because its a horrible game due to all the points that @Geonjaha made. This doesn't deserve a score anywhere near an 8/10. When it comes out in NA I might give it a go once again. Where is that header from? I have gotten through this great game and I would actually be interested in a sort of "New" Adventure of Link for the Wii U - Some new side-scrolling goodness along the lines of NSMB. Love this game. I think some people forget to level up if they are having trouble getting through a certain area. I love this one, good times. I liked how if I never knew where to go, I could go grid for a bit and then when I figured out my way it would be easier. So many challenges and just a little planning helped so much. I hope no one shy's away from the difficultly, as only hard, not impossibly so. You kids are all wrong...this game deserves a 10. Best Zelda ever. I beat this with the Ambassador program. Easily the hardest game I've ever completed. Thunderbird was impossible before I tried reflect. I went through the final dungeon so many times, I memorized it's exact layout, and was able to make it to the boss each time with full life, health, magic and lives, only for him to kill me every time. I leaned to farm respawning bots to get magic. I got this as an ambassador, but I will play it only when restore points are available. I really like this game. Sure, it was different (just like Ys III: Wanderers from Ys was different from most Ys games), but it didn't make it such a bad thing as far as I'm concerned. The sidescrolling aspect was nice, and the leveling up elements (like an RPG) was a nice touch, too. It's nowhere near as excellent as The Legend of Zelda: A Link to the Past or even The Legend of Zelda: Link's Awakening, but Zelda II: The Adventure of Link is a fun, good game all on its own, and it's one of favorites in the series. Honestly, I strongly feel this game totally trumps the first one. I finally beat this game after I got it as a 3DS ambassador. I have tried many times to finish it through original carts, rereleases and via emulators but never managed to finish it. The key to succeding in this game is to treat it like an rpg. Level up as much as you can. This does mean killing lots and lots and lots of random enemies but there are places you can do it really quickly. There are also more tricks like not killing the dungeon boss since you automatically level up. Save them for when you are in higher levels so you can get the next level easily. If you play it like that and not like a traditional Zelda game (go to the dungeon, kill the boss, go to the next dungeon, kill the boss) then the game is surprisingly easier. Also, I don't see many people talking about this, but when you finish the game, continue playing the same file to play again with all your levels in check. This game has excellent replayability. A must buy (I wouldn't have said the 3 years ago). This game was somewhat promising, but it does so much wrong it's not even funny. I disagree. It's still a decent NES action game. These are not flaws. They give the game more of a challenge. having to guess/need a guide for a majority of hidden secrets, most of townpeople saying useless stuff like "I know nothing" and "hello", having to waste time walking back to where you wanted to be when you die. And these are just common of RPGs from the 1980s. This is the single thing that annoys me in Zelda II. Especially when you are getting the last few levels which takes ages to level up. You can't even save experience points for the next time you play. Worse, you can't go back and get an upgrade you just passed on despite having enough experience for it. Experience should have been rupees instead and you should have been able to buy upgrades in towns instead of how it is. I would actually be interested in a sort of "New" Adventure of Link for the Wii U - Some new side-scrolling goodness along the lines of NSMB. I made a "would you like a new Zelda platformer like Zelda II" topic some time ago and people hated the idea. I totally desagree, this game is just different, not bad, people does that sometimes, When they don´t understand something they say is "bad". This game is awesome in making you feel like you are link, and leveling up is very fun. Yes is difficult, but not as difficult as battletoads for example, so, this game is totally amazing, and if you try to compare this to a newer game you are starting waay wrong, remember, there is no LTTP or OOT, there is no Zelda the way you know it still!!! i wanted to get this game,but when i saw it was for europe only...D:< I AM NOT ONLY A POKEMON FAN ,IM A ZELDA FAN AS WELL! ANOTHER BIG FAIL NINTENDO! Why you ask,i live in na but it didnt come to na eshop!it is so not fair! So this came to the NA eShop today, but I think it's the Ambassador version that doesn't have restore points (much rage for that) and instead of having an NES console and TV with the title screen, it's just a dull slab with the title screen. The manual doesn't cover too much information, unlike other VC games. I gotta wonder what happened here. Was this rushed for the American release or something? Nintendo…where are my Restore Points? Where is the restore point option? I appreciate the fact that this game came out on time. But it is missing the restore point option. As much flac as this game gets, I'd give it a 9. It doesn't hold your hand, it doesn't spoon feed you. You don't know where to go most of the time, which makes for a true Adventure game. I'll totally pic this up, it was great, and although few people see how, it was also innovative.